The title comes from the approximate depth at which one would suffer the bends if traveling too quickly to the surface. 30 ft down with a quick ascent is an ironic description of this piece as the emotion portrayed is a failed attempt at fleeing, a helplessness and broken spirit that follows with too many loses. In my recent work I am exploring the roles of prey and predator and the anthropomorphized characteristics each role can describe. 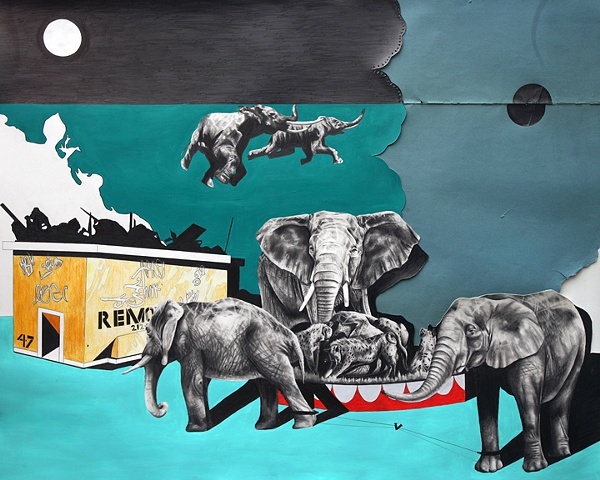 In this piece the elephants represent a power stripped of it’s force, while the laxidasical cheetahs devour their prey they are personifying the victor and conqueror. The mammoth creatures are tethered with thin ropes and can easily overpower their predators, but perhaps they have given up, broken they succumbed to their fate. The collected possessions that weigh most down are thrown away in a fruitless attempt to lighten the load. Bright colors exist despite the tragedy and perpetual hope is seen in the swimming elephants, moving along from sunrise to sunset.